The Legacy of Egypt Slot is a five reels slot with three row and 30 payline and comes from the Swedish game developer Play’nGo. The slot has the same theme as the Book of Dead or the Book of Ra by Novomatic – ancient Egypt. Also in this game is about the Free Spins which trigger the big profits. In addition to Wild Symbols, the Legacy of Egypt also has Pyramid Spins, which are the boost to the normal Free Spins. Like most Play’nGo games, you can play the slot on tablets, smart phones and desktops. The minimum bet is 30p and up to £90 you can bet per spin. 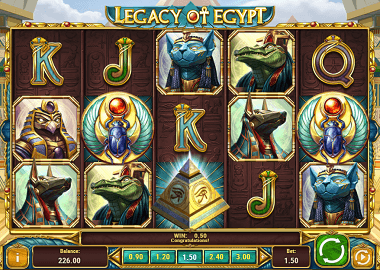 Symbols and Payouts: The slot is as mentioned in the old Egyptian style. The icons are 3D animated when you get a payout. There are playing cards symbols for smaller payouts and themed symbols for high payouts. The low paying symbols are 10, J, Q, K and A. The more valuable symbols are all gods you know from other known slot machines. This includes Sekhmet the goddess of sun, Sobek the ancient god of crocodiles, Anubis the god of embalming and the dead, Ra the sun god as well as the Queen of the Nile which is Cleopatra and the Pharaoh itself. Last named symbol is the most valuable symbol. Free Spins feature: The pyramid symbol is your Scatter symbol and the scarab is the Wild symbol. If you land 3 or more of the pyramids on your reels, you will receive an instant win and free spins. Before you can start the feature, you must spin the Wheel of the Gods. Here you find out first how many free spins you get and with which multiplier your winnings are paid. While you are playing down your free spins, two pyramid symbols can trigger a feature in the feature. Pyramid Free Spins feature: With 2 Pyramid symbols during Free Spins you get up to 8 Pyramid Spins per free spin. With three Wild Scatter symbols, it is also possible to extend the Pyramid Spins. When this feature finishes, you continue playing with the normal Free Spins. Due to the multiple free spins variations it is possible to play very long bonus rounds. Your winnings will be correspondingly high. About Legacy of Egypt: Play’n Go is one of the most experienced software companies in the online casino industry. Just like Microgaming or Playtech, the company has been there since the very beginning. To date, the game developers have released more than 100 interesting and also very successful games. These include u.a. Hugo, Planet Fortune, Cops n Robbers, Wild North, Lady of Fortune and Riches of Ra. The most popular game is of course the Book of Dead, which is slowly reaching a status similar to some of the Novoline slots from Novomatic. The Legacy of Egypt Slot you can play just like some other slots for free. If you click on the banner at the top, the game starts in a new window. You can find more Play’nGo Slots here. Play’nGo slots can you play in reputed online casinos. The Spinit Casino, Sloty Casino, LVbet or the Next Casino. are good recommendations. All of these providers have a UK Gambling Commission license and offer very lucrative bonuses for you. For example, for the LVbet Casino we offer here exclusively 30 Free Spins without deposit – just for your registration. Play without risk and grab the winnings. You also get additional bonuses for your first deposit!